Agile2011 will be my first time talking to crowd of embedded software developers. I already know tossing my hat in the ring has been a good idea because the whole experience has me thinking from a different direction. I’m starting to see the necessity of better collaboration between hardware and embedded software experts on SoC development teams, but it didn’t really gel until I started thinking in terms of system functionality and usability. I’ve used this slide with a generalized design flow once before with a mishmash group of software developers to illustrate how our respective disciplines tie together. 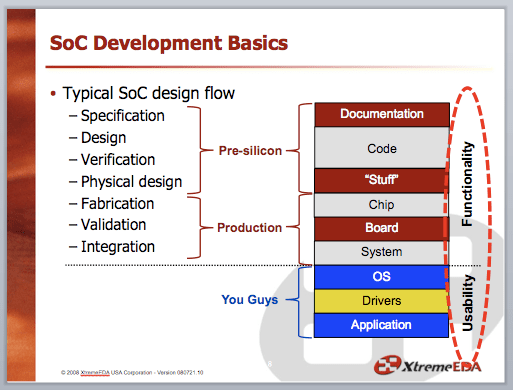 It’s a 5000ft view of an SoC development meant to show how we work on two different ends of the development spectrum. We hardware developers live down in the weeds. We see things like gates, counters, filters, packet transformation, the details of an interrupt mechanism and pin-level communications protocols. Our deliverables are normally captured in a hardware specification and our job is to build the hardware such that it’s functionally correct before it’s taped out. We are not users nor do we have much direct contact with users so the concept of functional correctness is probably the best we can do. Software developers are at the far end of the spectrum. Gates and pin-level protocol mean nothing to them. Their job is to take the hardware we’ve given them and make it usable for our customer. A potential problem with this situation, in case you haven’t seen it yet, is that hardware that’s functionally correct doesn’t necessarily translate to hardware that’s usable. We hardware developers can stew over clock-by-clock details that have zero impact on the system, while at the same time brush off details that can cause head-aches for software developers or even cripple the system entirely. Corner cases for us can be primary functionality for them. So how can we close the gap between functionality and usability? I think there’s work to do on both sides of the fence. All these are things I thought of while putting together my Agile2011 talk. I like the functionality and usability labels to emphasize that the focus of hardware and software experts is fundamentally different. I’m hoping bringing functionality and usability together underscores the critical importance of early collaboration with software developers. They understand the system and interact with users in ways that we don’t. Considering everything they do know with everything we don’t, if we plan on having happy customers, they’re our only hope! This entry was posted in Agile2011 and tagged Agile2011, embedded software, functionality, usability. Bookmark the permalink. Great post Neil. You might find this difficult to believe, but my experience is that the hardest thing to change is “getting folks to treat hardware and software developers as part of the same team.” This fundamental shift often needs to start much earlier than when the teams are forming. For example, I find that the initial strategy (go/no go) decision before a project is launched pits a hardware development leader against a software development leader competing for a slice of the same funding pie. If this is how the project starts – two separate R&D teams competing for $ – the relationship is difficult to mend from there on out. catherine. thanks for pointing that out. that’s a level of negotiation that most developers, I expect, wouldn’t even see. This is a fundamental shift then… teamwork starts even before the teams get involved! It’s a good summary. More communication at early stage yield a better product. Sometimes SW doesn’t know if some feature is low cost in HW, and sometime HW try to implement some things on not a time critical path which are better to go in SW.